In this year’s pilgrimage to Pine Mountain, we will hear how part of Southern Company CEO Tom Fanning’s compensation will be tied to meeting the company’s low-carbon goals. That Annual Report page on Microgrids and Batteries looks good. Until you start to notice what’s missing from the documents. This entry was posted in Climate change, Georgia Power, Natural gas, Nuclear, Solar, Wind and tagged AGL Resources, Callaway Gardens, Climate change, compensation, explosion, GA PSC, Georgia, Georgia Power, Homerville, JAX LNG, LAKE, Lowndes Area Knowledge Exchange, Lowndes County, natural gas, Nuclear, PHMSA, Pine Mountain, Pipeline Hazardous Materials Safety Administration, Pivotal LNG, proxy, Solar, Southern Company, Stockholder, stranded investments, third-degree burns, Valdosta, Wind on April 17, 2019 by John S. Quarterman. 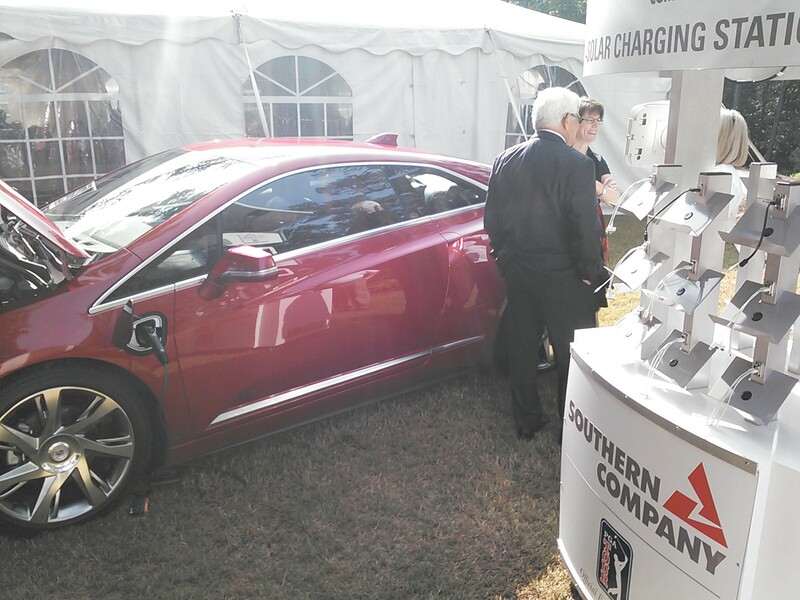 Solar car charging station at the Southern Company Stockholder Meeting: that’s new. Other solar changes were detectable, if you knew what to look for, and with hints from SO CEO Tom Fanning and new R&D VP Larry Monroe here are some, while we’re waiting on SO for video and transcript. This entry was posted in Coal, energy conservation, energy efficiency, Georgia Power, Natural gas, Nuclear, Renewable Energy, Solar, Wind and tagged 28 May 2014, Callaway Gardens, CEO Thomas A. Fanning, Coal, energy conservation, energy efficiency, Georgia, Georgia Power, John S. Quarterman, LAKE, Lowndes Area Knowledge Exchange, natural gas, Nuclear, Pine Mountain, Renewable Energy, Shareholder Meeting, Solar, Southern Company, storage, Wind on May 29, 2014 by John S. Quarterman. You are invited to attend the 2014 Annual Meeting of Stockholders at 10 a.m. ET on Wednesday, May 28, 2014, at The Lodge Conference Center at Callaway Gardens, Pine Mountain, Georgia. This entry was posted in Coal, energy conservation, energy efficiency, Georgia Power, Natural gas, Nuclear, Renewable Energy, Solar, Wind and tagged 28 May 2014, Callaway Gardens, CEO Thomas A. Fanning, Coal, energy conservation, energy efficiency, Georgia, Georgia Power, John S. Quarterman, LAKE, Lowndes Area Knowledge Exchange, natural gas, Nuclear, Pine Mountain, Renewable Energy, Shareholder Meeting, Solar, Southern Company, Wind on May 27, 2014 by John S. Quarterman. SO CEO Tom Fanning is a true believer in “all of the above”, yet a skeptic about natural gas. However, he really doesn’t have much faith in renewables, as he indicated at the 22 May 2013 Southern Company Stockholder Meeting and even more strongly in the Wall Street Journal. This question is from Stephanie Coffin of Atlanta, Georgia, and she holds 18 shares of stock. SC: How are you, Tom? TF: Dynamite. How are you? SC: Last year, I came to this meeting to ask a question and to listen to the Southern Company reports. And so before I came I got to thinking about what has changed since the last meeting. I think two things, and then I’ll ask my question. The first is the chairperson’s salary increased 34 percent, over $13 million a year. I’m sure the retirees and stockholders in the room wonder about the $13 million salary and see that as negative PR in the face of continuing recession. $13 million a year, most of us are on fixed income. I mean, your income is fixed, too, but it’s very high. Mine is pretty low and we all have to pay electric bills. The second change, and then I’ll ask my question, is that now 70 — 97 percent of all scientists believe that climate change — that is, global warming — is real and caused by human activity and this is a big shift. Last year we were the climate deniers, we’re in control, and now 97 percent of all scientists say it’s real, it’s coming, you better get ready. In the face of this scientific consensus the Southern Company has maintained its reliance on fossil fuels, mountaintop coal, old coal plants and pushing nuclear power with huge wattage demands and the dangers of nuclear wastes. This entry was posted in Coal, Economy, energy conservation, energy efficiency, Georgia Power, Germany, Natural gas, Nuclear, Renewable Energy, Solar, Wind and tagged 22 May 2013, basket, Callaway Gardens, CEO Thomas A. Fanning, Coal, compensation, diversify, Economy, eggs, energy conservation, energy efficiency, fixed income, Georgia, Georgia Power, Germany, John S. Quarterman, LAKE, Lowndes Area Knowledge Exchange, natural gas, Nuclear, Pine Mountain, portfolio, Renewable Energy, salary, Shareholder Meeting, Solar, Southern Company, Wind on July 4, 2013 by John S. Quarterman. Why is SO gambling our health and dollars on Plant Vogtle when Georgia Power could be getting on with solar power? SO CEO Tom Fanning avoided the first part of Gloria Tatum’s question by simply denying it, and danced around the second part by saying the rate hike for Plant Vogtle’s cost overruns would only be 6 to 8 percent, not 12 percent. Do you want to pay 6 or 8 percent more for a radioactive white elephant when you could be getting power from the sun for less? TF: Call me Tom. Gee whiz. GT: Tom. Hi,Tom. It’s great to be here on this beautiful day. TF: Thank you. Yes ma’am. GT: And I know Southern Company’s done many wonderful things, but I want to point out a few things to you today. First, you know, after the Fukushima meltdown, TEPCO’s $50 billion nuclear complex became a worthless liability. The deadly radiation still circles the planet, polluting the earth and increasing cancer. Other countries have abandoned their nuclear and they’re looking to renewable, but Southern Company’s affiliate, Georgia Power, continues construction on two new nuclear reactors at Plant Vogtle. Now Shell Bluff is a community down the stream from Plant Vogtle and it has experienced a 25 percent increase in cancer since Vogtle 1 and 2 have been built. This entry was posted in Coal, CWIP, Economy, Georgia Power, Germany, Health Care, Law, Nuclear, Renewable Energy, Safety, Solar, Wind and tagged 22 May 2013, Callaway Gardens, CEO Thomas A. Fanning, Coal, CWIP, dam break, earthquake, Economy, flood, Fukushima, Georgia, Georgia Power, Germany, Gloria Tatum, Health Care, John S. Quarterman, LAKE, Law, Lowndes Area Knowledge Exchange, Nuclear, Nuclear Watch South, Pine Mountain, Plant Vogtle, radioactive, Renewable Energy, Safety, Shareholder Meeting, Solar, Southern Company, TEPCO, Tom Fanning, tritium, tsunami, Wind on July 4, 2013 by John S. Quarterman. SO CEO Tom Fanning used Julia O’Neal’s question about cost overruns to tout the alleged benefits of Kemper Coal, which include selling CO2 to oil companies to pump into the ground to produce more oil. He didn’t mention that oil is then burned to produce more CO2. And that Mississippi lignite coal he said would otherwise stay in the ground? Yes it and its CO2 would stay there if SO would get on with solar instead of coal. Before her question, he had not said much about that project, mostly this about Major Projects, at 29 minutes and 28 seconds in SO’s own video of the 22 May 2013 Southern Company Stockholder meeting. You’ll have to skip there manually, because of the SO’s video format. SO prohibited “unauthorized” videoing, so we don’t have the usual LAKE video on YouTube. I always call out Vogtle and Kemper County. Both projects are going to serve our customers for decades to come. We’ve had some challenges with Kemper. We’ll probably talk about those later. But when I think about the value that these projects will bring, I think our customers, and the economy of the southeast, will be benefited for decades. And we’re very excited about the progress we’re making on both of those. This entry was posted in CO2, Coal, CWIP, Economy, Georgia Power, Government, Natural gas, Nuclear, Oil, Solar, Wind and tagged 22 May 2013, bonds, Callaway Gardens, CEO Thomas A. Fanning, CO2, Coal, Economy, Georgia, Georgia Power, Government, John S. Quarterman, Julia O'Neal, Kemper Coal, LAKE, Lowndes Area Knowledge Exchange, Mississippi, natural gas, Nuclear, Oil, Pine Mountain, ratepayers, Shareholder Meeting, shareholders, Solar, Southern Company, Thomas A. Fanning, Wind on June 3, 2013 by John S. Quarterman. Here’s Southern Company’s own video of the 22 May 2013 shareholders meeting. More detail will follow on the record number of questions, and CEO Tom Fanning’s answers, in addition to this one already posted. This entry was posted in CO2, Coal, Economy, Georgia Power, Natural gas, Nuclear, Renewable Energy, Solar, Wind and tagged 22 May 2013, Callaway Gardens, CEO Thomas A. Fanning, CO2, Coal, Economy, Georgia, Georgia Power, John S. Quarterman, LAKE, Lowndes Area Knowledge Exchange, natural gas, Nuclear, Pine Mountain, Renewable Energy, Shareholder Meeting, Solar, Southern Company, Wind on May 29, 2013 by John S. Quarterman.